Today’s post has to do with political maneuverings that should cause outrage. I cannot recall a single day upon which as much strategic deviance was perpetrated on the American people. We’ll begin in Washington and end in Wisconsin. Strap in; the ride’s going to be rough. The politicos are counting on you bailing out. The budget talks are not going well. The Democrats remain adamant on the removal of tax breaks for the rich and for corporations. Regaining these funds from those who shouldn’t get them and don’t need them would bring $1.2Trillion back into the coffers, they say. The Republicans remain rhetorically adamant. This amounts to a tax increase, they say. The U.S. budget deficit is not the $2T originally set as the goal for the bi-partisan Biden Commission. It is, in fact, $4T spread over ten years. If agreement had somehow been achieved on a $2T package of budget cuts/tax “increases”, the debt ceiling would have been allowed to go higher to avert economic calamity. But we would have had to return to the table again in two years — right after the 2012 general elections — to fix the rest of the problem. Republicans believe they would own both houses of Congress then, and the prospect of slashing programs Americans want and need is not appealing. Seeing only a stalemate on the $2T negotiations, President Obama figured that he might just as well solve the whole $4T problem. This Democratic president out-Republican’d the Republicans. And what did the Republicans do? They heaped criticism on the president for tackling a problem that could not possibly meet with approval in Congress. Their worry, in fact, has nothing whatsoever to do with Congressional approval. It has everything to do with the 2012 elections. If Republicans are perceived as having capitulated on tax “increases”, or for having caused the country to default on its debt, they stand a good chance of losing many of the races in next year’s elections. The stakes are huge. One third of the Senate is up for election/re-election, and all of the House is up for election/re-election. The Senate is now Democratic-controlled. The House is now Republican-controlled. Losing elections means that Republicans could be weakened in the Senate next year and, worse, lose their majority in the House. They would lose the power they now enjoy. And in Washington, “power” is the second most important word; “re-election” is first. The only way to avoid such a political disaster is to pin the blame for the process and its result on the Democrats in the person of President Barack Obama. Members of both parties would deny the request. The president would then veto their “measure of disapproval”, effectively approving his own request. It is all but impossible to gather a two-thirds majority in Congress to override the presidential veto. The net effect? The president (and, by association, Democrats) get the blame for continued and growing budget problems; Republicans get elected/re-elected. Even some conservative critics are calling this an abdication of Congressional responsibility. The first job of Congress, after all, is management of the budget. Nevertheless, under this plan, the president gets his debt ceiling (without any budget cuts), and Republicans score political points in a critical election year. Is this how our government is supposed to work? Which brings us to Contortion #2. Wisconsinites of both parties are angry with Governor Scott Walker (R) for — among other things — ramming through legislation which removes collective bargaining rights from unionized state workers. So unhappy is the electorate that the first of four recall elections was held today targeting nine state senators (including three Dems) who voted with the Governor. So far, so good. Voters are using the processes available to them. However, Republicans inserted six fake Democrats (wolves in sheep’s clothing?) against Democratic incumbents. The Republican’s out-of-the-closet placement of phony candidates caused a delay in the upcoming general election by a month thereby giving Republican incumbents more time to distance themselves from accountability for their anti-union votes. Again, the question: Is this how our government is supposed to work? Once upon a time, our elected representatives would debate the issues on their merits, on ideology or both. At day’s end, they would repair to the backrooms, hallways and offices, light up cigars, and compliment each other on the vim and vigor of each others’ arguments. And they’d chat about the kids’ achievements in school, and they’d brag about the latest accomplishments of the home team. There was a collegial atmosphere then; “respectful opposition” was the term applied to it. And it was here, in the smoke-filled back rooms, that the true business of budgetary policy-making (Congress’ primary responsibility), and its legislative functions took place. Here – for better or worse – is where the real work got done. This was not a perfect system, of course, but accomplishments were many. At the end of a session, you could count the number of actions taken by your hard-working members on Capitol Hill — both branches. This was the picture in Washington only fifty years ago. It can be legitimately argued that this era in American politics was either good or bad. What cannot be argued is that the body of work done then is mirror opposite of that which gets done now. The question is not one of quantity over quality. It is of quantity over nothing. In a think piece broadcast last Thursday on NPR’s “Marketplace,” President George W. Bush’s chief speechwriter, David Frum, posited one reason for the demise of respectful opposition: “Congress goes home for the weekends.” While at first seeming far off the point, Frum argues that in days past, our representatives moved to Washington, D.C., families and all. These guys were neighbors; their kids attended the same schools; they formed a community of people with a singular interest: the governance of a country. You don’t take relationships like this and eviscerate them on the floor of the Capitol the next day. Campaign rhetoric happened. “Beltway insider” became a brand to be avoided. It meant all the worst things about Washington; it meant the member was an integral part of what was wrong with our government. So the pols moved back home as if to prove their ‘outsider’ status. Fly home for weekends with the family and constituents; commute to D.C. for another week of doing the work of the people. But, whereas the homefolk get two days of the week, power-brokers get five evenings of each week. These, of course, include the lobbyists, special interests, and donors. C-SPAN happened. It was 1979 for the House; 1986 for the Senate. C-SPAN brought the backroom work into the chambers for all to see. Positions held by elected officials were now clearly visible to constituents. Any compromises to be made were made in front of all. Gerrymandering happened. This darling topic of 9th grade civics classes is nothing new. What is new is the vigor with which the partys in power are re-crafting electoral districts following each census. The purpose of redistricting should be demographic balance. Instead, it is now the assurance of that party’s dominance and re-election. With that kind of security, why would a member bargain with the opposition party? SCOTUS happened. In 2010, The U.S. Supreme Court effectively removed the limits of corporate funding to groups advocating for or against a cause or candidate. The court’s rationale was that restrictions impaired free speech. The result is massive amounts of money being poured into smear campaigns (commercials, documentaries, etc.) by corporations through lobbyists and special interest groups. Think “Swift Boat Veterans for Truth” and “Hillary: The Movie.” Such donation can now be done with anonymity. We’ll never learn who’s spreading the lies. The Tea Party happened. Not unlike other such movements in American history, the Tea Party’s life-cycle was birth, chaotic absence of clear purpose, and death (the 2008 general election). Then resurrection. How? Why? This “movement” exists today with guidance and funding from deep-pocketed companies whose only interest is their own profitability. Their modus operandi is to stir the unhappy constituents with specious information and outright lies. The hornets are many, and the money is huge. So members of an entire party are being cowed by a force as willing to sink a Republican ship as a Democratic ship in order to achieve the donors’ covetous ends. On the flip side, members who ally themselves to this purported “ultra-conservative agenda” find that they cannot lose. And re-election, after all, is the first order of business in Washington. Science happened. Neuroscientists are beginning to understand that certain human brains are predisposed – wired, if you will – toward the political right; others toward the left. A result, for example, is that a staunch Democrat will ignore charges against his candidate, and harden his support for that candidate even after the charges are proven true. In times past, better reasoning was used. Now, there is no reason to reason; the political opposition must be opposed…no matter the truth. This makes swing voters the more coveted. If the partisans can’t be redirected, the swing voters hold the power to determine elections. If despair, cynicism and apathy grow among the electorate, who can blame them? They’re probably correct in believing that their votes don’t count. Indeed, with redistricting, a vote doesn’t count if the vote is for the “wrong” party. Only the ruling party can win. What, then, will it take to move our body politic off the dime (pun intended)? Something tragic? Gabby Giffords. Something euphoric? Osama bin Laden. Something devastating? “The Great Recession.” Why should anything work when something as awful as 9/11 brought civility to our midst for less than a week? If it seems that our governmental world is going to hell in a handbasket, it is. But as long as Americans continue to draw breath, Americans have the power to effect change. We have only to collectively resolve to improve our government, gather and speak with one voice, and push harder than the other guys. It’s our country. The cost for not doing this is paralysis and anarchy. America is better than that. I don’t have to think too hard to recall July 4th parades down East Ridgewood Avenue and the hotdogs and hamburgers and fireworks. The need for soldiers then was great. The number of volunteers were few. President Kennedy had instituted a draft and, along with it, a number of restrictions: least preference to married men with children; greatest preference to single men, and many shades in between. By 1969, when these restrictions had become impossible to work with, a lottery was instituted in which preference was given to almost no one. Your birthdate was assigned a random number from 1 to 365. The draft lottery number was affixed to your draft card. The closer the number was to 1, the likelier you were to be drafted. I was a lost youth at the age of 17. I knew the potential within me but couldn’t figure out how to exploit it. I had left home and was struggling to find a place in the world. Buildings were burning down around me; the race riots. Bras were being burned; women’s liberation. Assassinations. Counter-culture. Crime. This was a turbulent time in American history. I watched it all close up as if a reporter without a notepad. Someday, I thought, these experiences would become useful. My draft card arrived. Number 46. I was going to Vietnam. I was required to have a physical conducted at some humongous military building in Newark, New Jersey. Two thoughts always come to mind about draft physicals. Arlo Guthrie captured the indignities and ironies about this particular brand of processing in his 1967 epic spoken song, Alice’s Restaurant. The other thought is about the abstract depiction of the draft physical in the 2007 movie, Across The Universe. If you’ve never experienced a military physical, these two cultural references will give you a strong sense for what they were like. My own experience paralleled both the song and the movie. I was poked and prodded six ways from Sunday. I was asked questions repeatedly as if I had never answered them before. I was a small piece of meat in a very large market where the only thing that mattered was a ‘1-A’ stamped on your draft card. They needed to throw your meat onto a C-130 and get you to Saigon pronto. Everything about your body is explored in these physicals. One such thing is your nose. Mine was discovered to have a deviated septum. So they gave me a bus ticket and orders to see a doctor in West Orange who specialized in such things. I remember clearly the exaggerated features of his face; particularly his bulbous nose. He was a Jewish man who was, quite frankly, tired of examining American boys who would be sent to war. After prodding inside my nostrils, he almost sneered as he said, “You can’t go to Vietnam wid a nose like dat!” And he marked my paper 4-F. I was now unqualified to fight because the inside of my nose was a little crooked. A lot happened between then and 1976. I did some growing up. The war ended, though not easily. I got rhinoplasty to correct the deviation of my schnoz. I got married and we became pregnant. I needed medical benefits and some direction in my life. So I volunteered for, and was accepted by, the U.S. Air Force. Here, I knew, I could explore the gifts and talents inside me. There are millions of men and women alive today who have served in the Armed Forces, each with his or her own bucket of stories. Mine have to do with being a non-conformist in a world that required conformity. I made a conscious decision to do things the Air Force way, and while there were hiccups in my execution, this turned out to be a decision well-made. My six years of service were among the best years of my life. I determined early on that I would get everything from this experience that I could, give 110% back to the Air Force, and then parlay my skills in the real world. I’ve shared some of my stories in previous posts: here and here. My gifts and training were in journalism and writing. These were applied in radio broadcasting and in television production. I had great success in an environment that rarely rewarded the individual; only the collective…that’s the military way. I got to chronicle all manner of events in places most people never think of. I got to work with good people all fixed with the same purpose. One of my early tasks was coverage of military ceremonies, a dull prospect, I thought at first. Standing behind a television camera shooting General so-and-so who was extolling the virtues of this military unit or that; or of the homecoming of soldiers and airmen who’d served overseas; of the president’s visits to our base; of the funerals of the fallen. Each of these ceremonies had one thing in common: the raising of the colors and playing of our national anthem. In years past, the flag was just a symbol to me, and the anthem was just a contorted piece of music. Now I found it difficult to focus because my eyes fogged up almost every time I experienced this part of each ceremony. The feeling remains strong these many years later. I’m a civilian now, but I still feel the urge to stand at attention and salute when the Star Spangled Banner is played. I feel the urge to tell someone, anyone, how deeply I appreciate our men and women who have served, and about the gift that America is for each of us. I feel the urge to thank God for my country. I’m picking sides on this one. 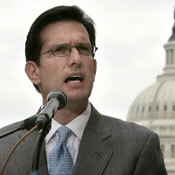 House Majority Leader Eric Cantor (R-VA) picked up his marbles today and went home. For all the world, it seemed like the ultimate childish play. Perhaps so. But the stakes are much higher, and there’s a stench of intra-party intrigue. I’ll tell you the punchline right now: this maneuver was all about improving Cantor’s already-strong profile with the ultra-conservative right wing of the Republican Party, and weakening the power of Republican House Speaker John Boehner. The political result could be a Grand Old Party lying in pieces on the Capitol floor. Worse still, the interests of Americans will not be served at all. Only Cantor’s. Here’s what happened: Vice President Joe Biden — on direct orders from a ‘tax-and-spend’ Democratic President, Barack Obama — has been leading negotiations with top political leaders from both sides. The purpose is to find ways to cut spending. Democrats want to eliminate the tax breaks being given to special interests, heavy industry, and the wealthiest individuals who least need the favors. 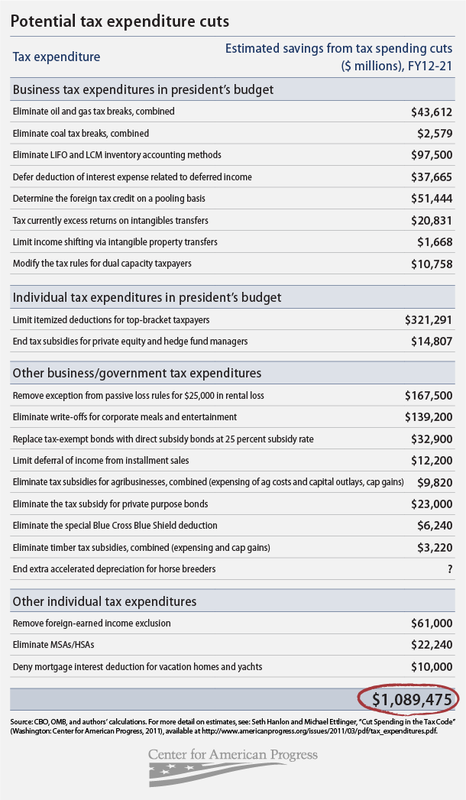 Republicans are saying that this amounts to a tax increase; a tactic they will not brook on its face. Both mantras sound lovely to the party faithful of both sides until you listen more closely. These favors are draining the American tax base and have no benefit for the working- and middle-classes who make up better than 75% of America’s citizens. Here again is a case where unfiltered numbers are hard to find. In March, the Center for American Progress, a progressive (“radical-left”) non-profit, developed what I believe to be an unfiltered graph. All the big numbers start with “billion” except for the last. If you jumped right away to the bottom (and who could blame you), that big circled number is $1.1Trillion. That’s already HALF of what the Biden commission is trying to achieve. Mr. Cantor’s reasons for ditching today’s talks? 1) “[T]he Democrats continue to insist that any deal must include tax increases.” I think we’ve pretty well identified this argument as disingenuous at least, and as an outright lie at most. 2) President Obama isn’t involved enough. Really? You want the president to toss the enormity of his responsibilities to hold your hand? His vice president isn’t involved enough for you? Does the president’s lack of involvement mean that you (Cantor) can justify removing yourself from any involvement? Which brings us to the spectre of political intrigue. The narration of today’s events will now turn from the merely gut-churning to the downright gory. One has to ask why Mr. Cantor would be so willing to stage such political theater. There are two answers. First, it increases his perceived value to the deep-pocketed Tea Party, and second, it steals power from the slightly-less-extreme Republican House Speaker, John Boehner. How? If Cantor won’t touch this less-than-Tea Party-standard deal, Boehner would be forced into a position of cutting it himself. This means that Boehner would have to make the tough decisions, even the concessions, necessary to get the job done. Having done so, his name would be sullied, not Cantor’s. 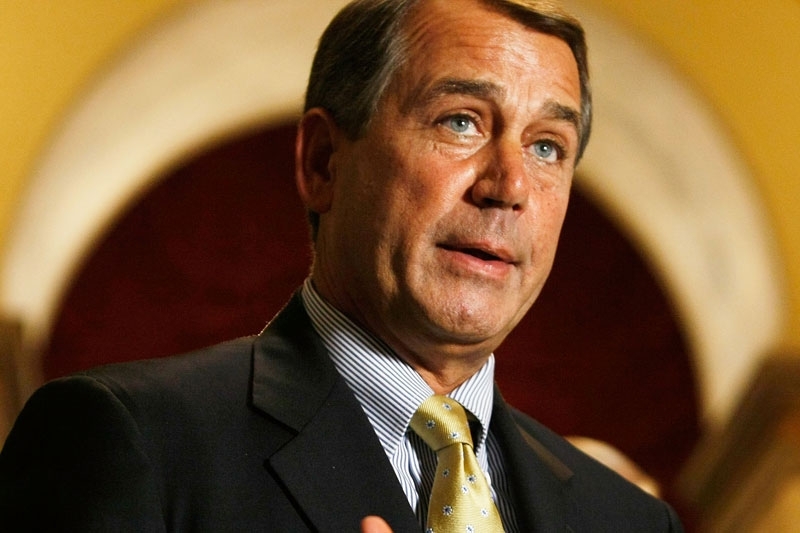 Boehner comes out weakened to the point of – perhaps – losing his leadership. Cantor comes out strong. He held high the extreme-right brand. Representative Eric Cantor represents Eric Cantor here. He takes an aggressive role in the destruction of his own Republican Party thereby weakening our form of government. He plays a game where the only winner is Eric Cantor. The loser is the American people. There are things in life that you automatically know to be suspicious of: product claims in television commercials; the fine print in a contract; the earnest assertion of a child who’s hiding the candy behind his back…to name but a few. Politics is a passion for me and I spend a fair amount of time studying the subject. I’ve learned not to get my dander up over the vast majority of the machinations of our body(s) politic. There’s hardly anything new under the sun, after all. But one thing still manages to make the hair stand up on the back of my neck: the mis/use of facts. Or, more to the point, lies. We could talk about global warming or about the president’s place of birth. But I am presently thinking about the economy. My blood is boiling because Sarah Palin told Fox‘s Greta VanSusteren on Tuesday that President Obama has increased the national debt by more than “all other presidents combined.” It’s an old canard kept alive by, well, liars. Facts, even those involving hard numbers, are vulnerable to interpretation. We are bombarded daily by facts. There are so many of them. The cacophony muddies them. We become confused by them. We don’t like being weakened by confusion, so we shut them out entirely. Or, perhaps worse, we select only those facts that amplify our personal perceptions or strongly-held beliefs. So when Ms. Palin cites the “facts” as she chooses to see them, and Ms. VanSusteren fails to perform her journalistic duty by challenging them, the faithful are being fed their chosen poison. That’s fine…it’s a free country. It took Google 0.09 seconds to show me the truth. On inauguration day, President Obama inherited a $10.6Trillion dollar debt from the previous administration. In the past two-and-a-half years, the debt has been increased by $3.7Trillion mostly resulting from Bush-era policies and some (e.g. the Afghan War; 2009 Recovery Act) adopted or initiated (respectively) by the current administration. No matter how you choose to interpret those facts, a school child can see that Palin’s assertion is easily $7Trillion wrong. 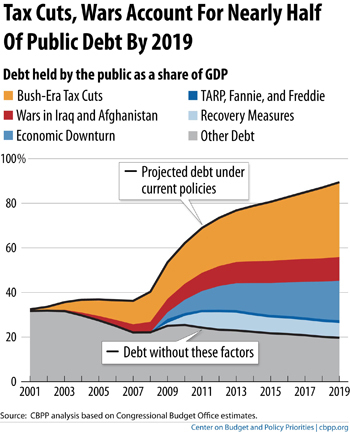 [S]imply letting the Bush tax cuts expire on schedule (or paying for any portions that policymakers decide to extend) would stabilize the debt-to-GDP ratio for the next decade. While we’d have to do much more to keep the debt stable over the longer run, that would be a huge accomplishment. This blog post is not a criticism of Sarah Palin. She’s far too easy a target. There are clowns aplenty — on both sides of the aisle — who play the same game. No, this post is an exhortation: It is incumbent upon us, the citizens of a country we profess to love, to learn the truth and to vote accordingly.